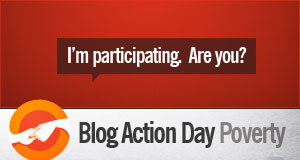 Today is "Blog Action day", where many bloggers come together and focus/discuss one issue: Poverty! As I sit and watch the presidential debate tonight, one can really see that the economic recession, depression....whatever we call it, is hurting many people. As I look at how much money my wife and I have lost in this past month in our investments...well it's discouraging! But there is one thing it is NOT. What it is not, is sickening! What is sickening is the issue of world poverty. When I see numbers and figures of people (and it's not just in underdeveloped countries.... News Flash: there's a poverty problem in the U.S. prior to the economic crisis) who live DAILY in poverty, hunger, and disease. looking at even our seemingly meager budget, my wife and I STILL can't imagine what it is like to live a life below the poverty line. It's not even a fair comparison. But maybe, just perhaps, we will remember how hard it is now that we have to cut back on some wants, and then think about those that have no budget for needs...little less wants. Poverty is a huge injustice in this world. Every person, made in the image of God; a child of God, deserves the basic human rights. Each person deserves the right to feed themselves and their families. Everyone deserves the right to have shelter and medicines. Everyone has the natural human right to live... to experience a life where each day's bread is provided. Do we hear the poor's prayer that says, "give us this day our daily bread." Perhaps when we were commanded to pray that same line as those who "have" it was partially a reminder that we DON'T have to worry about having food tomorrow, so let's think about what we can do for those who do have that stress. There are many links of charities to give to within the links above. Alison and I have several things we do. Compassion International is a good organization (I've known people who work with the kids), and we support a child from Honduras. There are a lot of other organizations we support, but you have to find the one(s) that's right for you. My personal favorite is the ONE Campaign. The reason I like this is because you don't send them money. If you want an organization to send money to, there is a list on there site here. I have worn the bracelet and shared the vision with many people for almost 2 years. I like that I can take a more active role. I have written letters, signed petitions, spoken with organizations I have connections with about partnering/supporting ONE, and have worked through those organizations to further the cause of ONE: the campaign to end world poverty! ONE wants the poverty issue to be known, to truly become an issue that we care about! They have been very active during this election year. Here's a vid. This may not be the organization for you, but still, help make the issue known. Talk with your friends and family about it. Make this invisible issue an ongoing discussion. Find a way where you can help, and know that it's not always about giving money. Your time and energy can be just as effective. This is more than just a "one day a year" discussion and issue for me. It is a big part of the essence of my calling as a follower of Christ.